Transparency seems to be all the rage on Capitol Hill these days. And what better way for Congress to connect directly with constituents than through Twitter, the free social-messaging site? 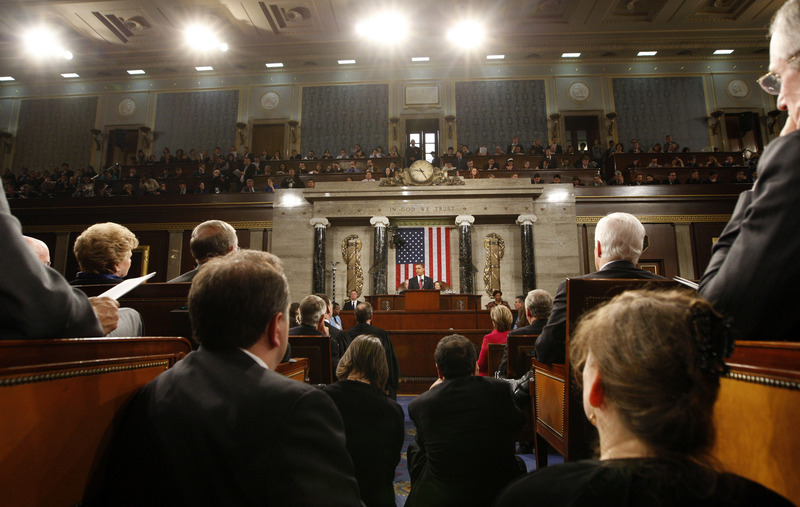 Members of Congress listen to President Obama's address Tuesday night. Some Twittered during the speech. Photo: Getty Images. As I began following the 100 or so members who currently use Twitter through a site called http://tweetcongress.org, I found the Democrat-to-Republican tweeting ratio a bit surprising. There are only 29 Democrats tweeting compared to 57 or so Republicans. As we saw in the last election campaign, Democrats have a reputation as being hipper and more plugged-in than their GOP counterparts. So are Republicans now trying to drum up support with the tech-savvy crowd through this hot medium that seems to be spreading like wildfire? Twitter gives the public a sense of what’s happening in now in the halls of Congress. It’s like a real-time backstage pass to Capitol Hill. We elected these people to do a job, and Twitter gives us a way to connect with them more directly than ever. During President Obama's speech Tuesday night to the joint session of Congress, Texas Republican congressman John Culberson posted, "This is always an awe-inspiring experience no matter who is President," and "Capt Sully is here - awesome!" These personal messages give us a behind-the-scenes look at how our government works, humanize our elected leaders and avoid the cumbersome rhetoric that we find in formal congressional correspondence. However, there are a handful of potential pitfalls in congressional tweeting, which might be why not every senator or congressman has jumped on the Twitter bandwagon. There are no Twitter filters or copy editors, and once a tweet is out there, there is no turning back. This can be a dicey prospect for a politician. Oops! Several minutes later another message followed, saying, “Disregard that last tweet from a staffer.” Insert tweet in mouth. So, should there be some filter or editor to protect our congressmen from themselves? Or can we benefit from these raw, unpolished glimpses at our elected representatives? Let us know what you think! Well, Callie did a great job – found this really interesting. We should leave it unedited but then will we "sink" when we realize how very stupid many of these electeds really are! I agree with your point on Republicans trying to connect with younger voters through new technology. Barring further "staffer" blunders like Barton's, it's also a way to generate rhetoric and permanent reference: "You'll see by my such-and-such date tweet I opposed the proposition banning Guitar Hero in public schools." Of course, that goes for both sides of the aisle. The fourth estate would do well to tap into this, to generate objective, to-the-moment updates on proceedings for younger, tech-savvy readers who poo-poo print. @Franko – Don't think any White House people or other Dems for that matter have leaked state secrets, unlike Rep Hoekstra (http://tinyurl.com/dh8wlp) who tweeted that he was in Iraq touring, while it was supposed to be top secret. I don't think we will benefit at all! What possible benefit can there be to seeing the human being in the raw, behind the habitual political camoflage? Noam Chomsky - "Lippmann argued that "the public must be put in its place," so that the "responsible men" may rule without interference from "ignorant and meddlesome outsiders" whose "function" is to be only "interested spectators of action," periodically selecting members of the leadership class in elections, then returning to their private concerns." For all the Tweetings and Tootings of change – what say do the public have ? Noooo!!!! No to filters. Let their butts hang out in the wind along with the rest of us. Filters and controls will again cause censorship and that is not what we need when it comes to communicating with our elected leaders. It is always a good thing when one of them blunders and sends a text/twitter that shows them for the fools they are. Don't we have enough censorship already? And secrecy from our elected officials? Transparency is about openness and honesty and that is what we need when it comes to our senate and congress members. I would like an uncensored version of the activities that each and every one of their sessions in congress so we can be more informed as to which of them is working for us and which is working for the large corporations and for themselves. Let freedom ring on the twitters. DENNIS - " I would like an uncensored version of the activities"
Perhaps, keep a web logbook, a summary of daily meetings ? No shame in relaxing, not shoveling taxpayer money to lobbyists.